Teachers from St Teresa’s School in Bluff took their pupils from seaside to countryside recently, as part of DairyNZ’s school farm visit service. Their trip to a Southland dairy farm gave the children a chance to see dairying in action. DairyNZ’s school farm visit service is an important part of our education programme. It gives Kiwi kids the opportunity to experience a day on a dairy farm by linking them with local farmers. 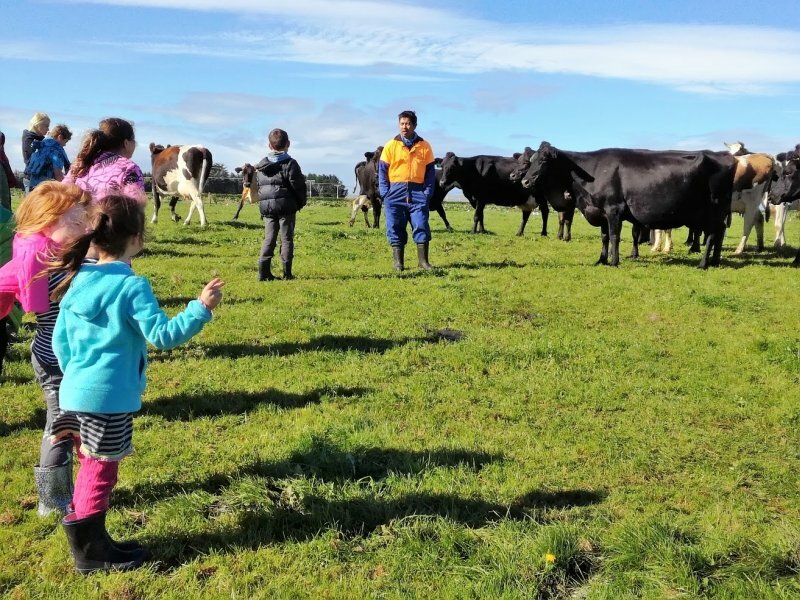 Every year about 8000 children visit a dairy farm, finding out what happens on-farm and learning about the connection between paddock and plate. Dairy farm manager Sherwyn Calos, his staff, and the team at Fortuna Group, are passionate about creating a positive and memorable dairy experience for urban children. They regularly host DairyNZ’s school visits on their Southland farm. Two classes of five- to eleven-year-olds from St Teresa’s School in Bluff were their most recent guests. Prior to their day on the farm, the children explored dairy-related videos and games in the classroom through ‘Rosie’s World’, a child-friendly and educational website run by DairyNZ. St Teresa’s also participates in Fonterra’s Milk for Schools programme, which sees Fonterra Farmers providing nutritious milk to school kids on a weekly basis. During their farm visit, the children gained real-world insights into where milk comes from, why it’s not green like grass and how milking machines operate. For many of them, it was their first time on a dairy farm. Sherwyn is keen for other dairy farmers to host similar visits, educating kids while encouraging New Zealand’s farmers of the future. St Teresa’s teacher Rosi Coyle believes it’s important for children to see where their food comes from and what life on a dairy farm looks like. Another St Teresa’s teacher, Dianne Gilroy, says the children loved their visit because they got to see how cows make and produce milk. They also learned what jobs there are, in case they want to be farmers one day. “The dairy sector’s an integral part of New Zealand and I think educating children about it is a must,” she says. Visit dairynz.co.nz/schoolfarmvisit to register as a school visit host.